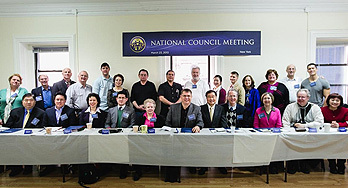 The Interim National Council of Holy Spirit Association for the Unification of World Christianity (HSA-UWC) in the United States convened its first meetings on March 23-24, 2013 at 4 West 43rd St. in New York City. Called into being by the Rev. Hyung Jin Moon, the HSA-UWC Interim National Council is constituted by delegates of the 12 d istrict c ouncils and representatives of the national headquarters. The c ouncil exists “to help our movement in America plan for the future in a new era of shared responsibility of Blessed Families” and “to review the current state of our church and to propose changes to be implemented going forward.” One specified task for this year is to develop a charter that sets forth the basic rules for local church governance, with an ear to the d istrict c ouncils and members. In December of 2012, the district councils formed the National Council by each selecting a delegate. As all delegates were male, Dr. Michael Balcomb, then HSA-UWC Vice-President and now current President, launched a discussion that led to each District Council selecting a female delegate and Rev. Moon choosing six of those 12 to join the National Council. Rev. Moon, together with Noah Ross, set up four committees in the Council: family, identity and positioning, evangelism, and governance. In the months preceding the March conference, Ross, consultant to Rev. Hyung Jin Moon, and Dr. Balcomb, worked out committee membership with the Council members. “We really are one family, with one heart. Health and growth go together. Part of our goal is to make ourselves ‘partnership-ready’ with the American community and with True Mother, ” Dr. Balcomb said. Ross then walked the participants through an orientation. He told the group they were here because True Parents want our church to grow, and because we want a healthy church we are proud of. He mentioned that healthy organizations plan, act and assess in a transparent and purpose-driven way. He called on participants to keep their interventions brief and succinct, to put all ideas on the table without judgment, and to express concerns in positive ways. He walked the group through a voting process using sticky dots, which were used after his presentation and after each Committee report. After this orientation, the council members used this process to determine that their highest priority was to create a strategic plan, followed by identifying the holes in the bucket, especially the departure of second generation, to ratify a charter and to turn around the image of the church. After a lunch break, each committee met to hammer out a picture of where the church is now, where it wants to be, the gaps between the two, and action steps. The “Report to Members” provides the specifics of each committee’s presentation and the top vote-getters among the Council’s comments. Did any general themes emerge from the discussion? One could point to the following. Unificationist Blessing and family life has unique value. On Sunday morning before the Manhattan Family Church worship, council members heard Kaye Allen, Director of Legal Affairs and the Corporate Secretary, report on financial and legal matters. She identified the Board of Directors and indicated that an annual report will be put into effect including salary ranges for corporate executives and staff, the identity of para-church entities, non-profit and for-profit subsidiaries, income and disbursements. She named many of these entities, familiar to church members, including CARP, Kodan, Ocean Church, KEA, UPF, Unification Theological Seminary, ACLC, the New Yorker Hotel and Manhattan Center. In response to Allen’s report, the c ouncil conveyed the need to protect public assets and people’s hearts. It called for transparency, participatory openness and professional management. It underlined the need for the charter to clarify the purpose of the organization’s entities and positions, their inter-relationships, the responsibilities and authority divided among them and the qualifications to hold them. The c ouncil also heard requests or questions from district and local councils, which highlighted governance and evangelical themes. The meeting concluded with a debate on voting rights on the c ouncil, with the conclusion being that HQ representatives cannot vote in general session but can vote in committee. The council then set a schedule to produce this report, created an Executive Committee composed of Committee chairs, chaired by Ross, set deadlines for committee submissions and the council’s next conference call, 10 p.m., EST, April 22. The Council closed in prayer at 3 p.m. on Sunday, March 24, 2013. To that end, one may say that the intergenerational dynamic helped us balanced faith and hope with honesty and realism. But the cool thing was the love. The cool thing was Dr. Balcomb hanging in with rapt attention, intervening himself, pushing the council’s envelope and talking to the participants straight. It was humor, as when one advocated “W e need baptism,” followed by a call for circumcision. It was passion and generosity. It was honesty about second generation flight and cheers of one member present who’s about to have a first baby. It was people on a scale of grandparents and grandchildren talking heart to heart about a shared future. It was Bishop Kim’s story of how a far-flung network of physicians with no central figure sought relentlessly to save his life. It was “my church is like this” and “oh really? My church is like that!” It was an organization talking like a family about how to be a church.